On September 9, 1919, an American nightmare came true. The entire Boston police force deserted their posts, leaving the city virtually defenseless. Women were raped on street corners, stores were looted, and pedestrians were beaten and robbed while crowds not only looked on but cheered. The police strike and the mayhem that followed made an inconspicuous governor, Calvin Coolidge, known throughout America, turning him into a national hero and, eventually, a president. It also created a monster: for two days, more than 700,000 residents of Boston’s urban core were without police protection, and the mob ruled the streets. "Compelling and lively . . . A City in Terror has plenty of drama and heroes and villains. Russell is at home in the history of the era and in Massachusetts, and he tells his story well; A City in Terror makes stimulating reading." "A fascinating study and social history of one of the strangest episodes in American labor history . . . as well as an unforgettable lesson in the machinations of big-city and state politics." "Francis Russell is wonderfully aware of the subtle but important distinctions of class and neighborhood that have been so much a part of Boston's history. A City in Terror is well written, full of shrewd social analysis and cultural history, and provides an account that gives perspective to todayís serious confrontations." 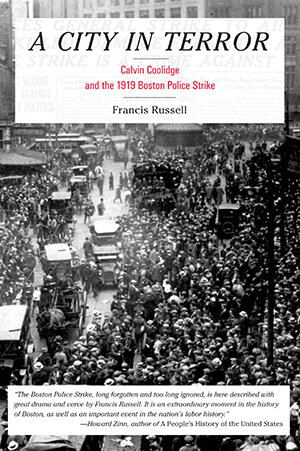 "The Boston Police Strike, long forgotten and too long ignored, is here described with great drama and verve by Francis Russell. It is an extraordinary moment in the history of Boston, as well as an important event in the nation's labor history."